Dolly Parton fans, start your engines. Dolly’s likeness will be featured on driver Tyler Reddick’s No. 2 Chevy Camaro at Bristol Motor Speedway on April 6. 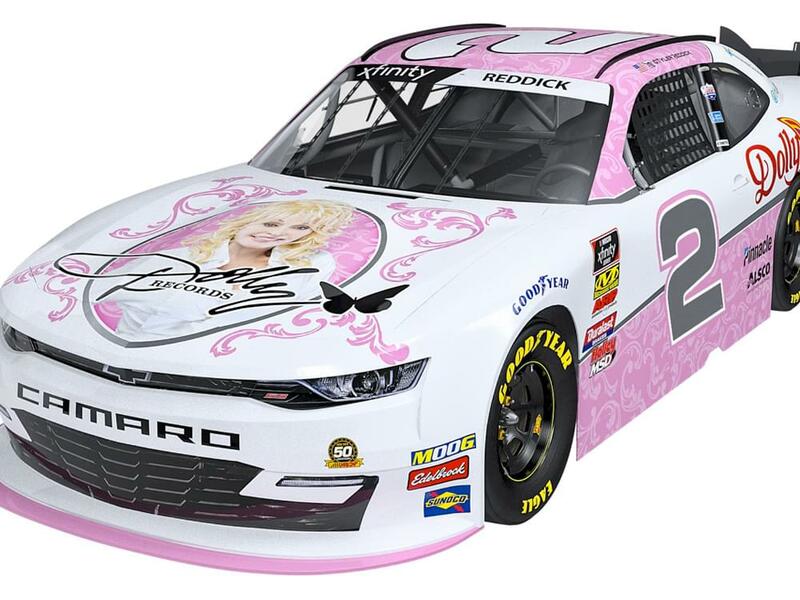 In addition to Dolly’s image on the hood, the white and pink car features the Dollywood theme park logo on the rear quarter panels, with the DollyParton.com website across the rear roof. Dollywood’s DreamMore Resort & Spa and Dolly Parton’s Imagination Library receive placement on the car’s rear fascia, and the logos of Dolly Parton’s Stampede Dinner Attraction, Dollywood’s Splash Country and the soon-to-open Pirates Voyage Dinner & Show each are included on the car’s deck lid. Tyler will be driving the car in the Alsco 300 at Bristol Motor Speedway, a NASCAR Xfinity Series event, which is NASCAR’s minor league circuit. The race will air on FS1 on April 6 at 1 p.m. ET.